Kimberly Middleton, Michael Nordin, and his mom Cassandra Nordin with some of the materials that have been donated for his bunk bed project so far. 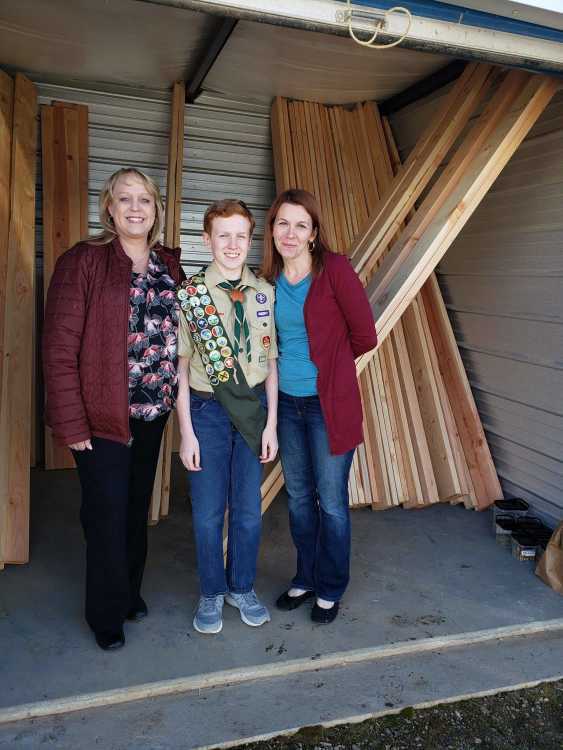 Michael Nordin, a local Mountain Home Life Scout with Boy Scout Troop 57 has taken on the project of building six sets of bunk beds with trundles, a total of eighteen beds, for Elmore County’s first safe house as his Eagle Scout Project. Bunk beds with trundles will allow for mothers and their children to sleep together in the safe houses’s rooms. Michael is relying solely on the support and donations from community businesses. He has already received material from Jim’s Lumber and donations on his GoFundMe page totaling just over $610. “With these materials, we are able to make at least three beds, but we still need mattresses for the beds and other supplies,” Nordin said.